NEW ORLEANS – Technical Symposiums will once again take center stage at the annual U.S. Track & Field and Cross Country Coaches Association (USTFCCCA) Convention. This year the Technical Symposiums will be presented by REKORTAN. 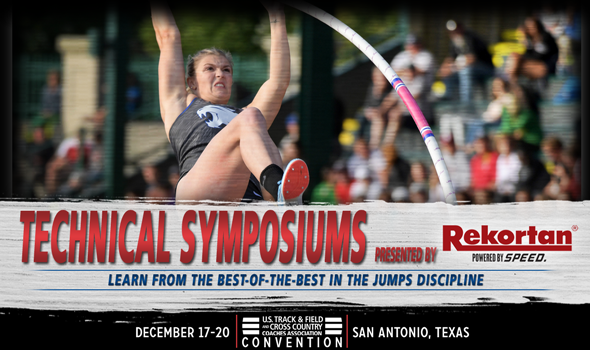 Like the past few years, there will be 32 Technical Symposiums spread across four days at the USTFCCCA Convention, which this year will take place from Monday, December 17 through Thursday, December 20 at the JW Marriott San Antonio Hill Country Resort & Spa deep in the heart of Texas. For those who don’t know about the Technical Symposiums – or need a refresher – four disciplines will be represented: endurance, jumps, sprints/hurdles/relays and throws. Eight coaches will share their knowledge with their colleagues in each discipline, which brings us to the grand total of 32 dissertations. Here is a closer look at five coaches who are scheduled to present Technical Symposiums in the jumps discipline. Success seems to follow Sean Brady wherever he goes. After coaching 19 All-Americans in 17 years at Southeastern Louisiana, Brady moved to Texas A&M, where he helped two athletes win individual NCAA titles in 2018 – Tahar Triki (outdoor triple jump) and Will Williams (indoor long jump). Triki and Williams were two of eight Texas A&M athletes directly coached by Brady who earned All-America honors in 2018. Kris Grimes-coached athletes have earned more than 75 All-America honors in a near 30-year coaching career. Those same athletes also combined for five individual NCAA titles in the multi-events and jumps, and one collegiate record (Lindon Victor in the decathlon). Grimes, who has coached at Abilene Christian, Missouri, Louisiana-Monroe, Michigan State, Washington State, Nebraska, Texas A&M and now Kentucky, was named USTFCCCA National Men’s Assistant Coach of the Year in 2016. Since his coaching career began in 1985, Dennis Mitchell has coached athletes to great heights – both figuratively and literally. Mitchell-coached athletes have earned 125 All-America honors in the past 33 years. And after arriving at Akron in 1998, Mitchell’s athletes have starred on the national stage as 41 individuals have earned 108 All-America honors. Of those 41 athletes, four have won individual NCAA titles in the jumps discipline: Three-time NCAA pole vault champion Shawn Barber, 2017 outdoor pole vault champion Matt Ludwig, 2000 heptathlon champion Christi Smith and 2014 outdoor pole vault champion Annika Roloff. Shawn Jackson is a proven winner and his current coaching stop at TCU proves just that. Since 2012, Jackson has coached athletes to a pair of individual NCAA titles (Lorraine Ugen in the outdoor long jump in 2013 and the indoor long jump in 2014) and 16 All-America honors. Just this past outdoor season, Chengetayi Mapaya and Scotty Newton became the first set of teammates since 2011 to finish in the top-5 of the outdoor triple jump at the NCAA meet. Prior to coaching at TCU, Jackson spent 17 years at his alma mater Louisiana Tech, where he helped built the program into a powerhouse in the Western Athletic Conference. Toby Stevenson is an Olympic medalist and former NCAA champion who has coached an Olympic gold medalist and multiple NCAA champions. Just this past year, Stevenson guided Olivia Gruver to the outdoor pole vault crown – her second in a row – and Tim Duckworth to a rare multi-event sweep, something just only one man had accomplished in NCAA DI history. Stevenson has coached at Stanford, Kentucky and now Washington since putting the bow on an incredible athletic career that saw him clear six meters in the pole vault and win the silver medal at the 2004 Athens Olympic Games. October 3, 2018 - CONVENTION UPDATE: Reserve Your Room For Convention Today! August 1, 2018 - Website For 2018 USTFCCCA Convention Is Now LIVE!